The Phoenix Hall of Byodoin Temple, where the temple’s principal image is enshrined, has two doors at its entrance the rear corridor, featuring Nissokan illustrations intended to evoke Paradise. The door on the right-hand side depicts mountains with buildings in their midst, including a Buddhist temple, while the images on the left door include the expansive sea and the setting sun above the horizon. While naturally the passing years have caused many parts of the paintings to peel off and a number of repairs were made by later generations, in light of the tough environment in which they were placed the original pictures can be said to have survived the years well. These are very important paintings in that they are rare examples of full-fledged paintings remaining from the mid-Heian Period. In September 2012, as requested by Byodoin Temple the National Research Institute for Cultural Properties, Tokyo conducted an optical study focusing chiefly on the paint remaining under the sliding locks that had been installed atop the pictures in later years, since those locks had just been removed. This more recent study focused chiefly on the outer frame of the doors, a part of the Nissokan doors not previously subjected to full-fledged optical study. Parts of the frames are decorated with patterns that from their materials are thought to be original. 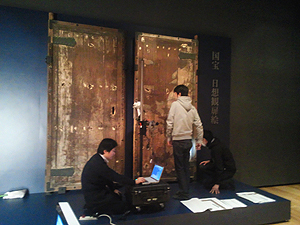 From January 8 through January 10, 2013, Seiji SHIRONO and Tatsuro KOBAYASHI of the Planning and Information Department took high-resolution color images, fluorescence images, and infrared images of the Nissokan images themselves along with other subjects including fragments of the Jobonjoshozu doors of the Phoenix Hall, preserved in the Hoshokan, and parts of the ceiling panels. Yasuhiro HAYAKAWA of the Center for Conservation Science and Restoration Techniques used fluorescence X-ray analysis to study the materials used in the frame patterns. After study of the data obtained, plans call for reporting the data to the Byodoin and then announcing it publicly in the future. Prior to this study, the Nissokan doors were moved to the Hoshokan, a museum facility equipped with an environment resembling that of the interior of the Byodoin, and they will be preserved and made available for public viewing in this facility. Plans call for installation of new doors with reproductions of the Nissokan paintings inside the Phoenix Hall, and this optical study, like its predecessor, is likely to contribute greatly to the process of preparing these reproductions.